New Delhi: Apollo Hospitals, Asia’s largest and most trusted multi-specialty chain of hospitals announced the extension of its air ambulance services network to several smaller cities and towns like Madurai, Mysore, Kakinada, Karaikudi, Karur, Trichy and Vizag through its current hubs in Chennai, Hyderabad and Bangalore. Several people in India don’t get medical attention within the golden hour which is very crucial in saving lives. Apollo’s air ambulance service will address the emergency medical need of people who are on the outskirts and far from the city limits. Each of the Apollo air ambulances will be manned by a full-fledged medical crew trained in critical pre-hospital care protocols to address emergency victims and critically-ill patients. The launch is in partnership with Bengaluru-based Air Aviators Rescue who will provide helicopters and the logistics support to Apollo Hospitals. 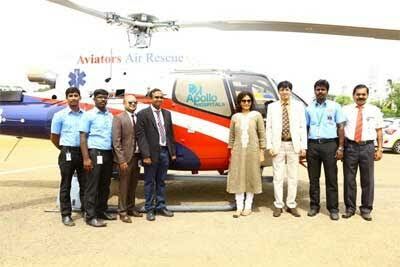 The air ambulance was launched by Dr. J Radhakrishnan IAS, Principal Secretary to Govt. of Tamil Nadu, Health and Family Welfare Department and Dr. Prathap Reddy, Chairman, Apollo Hospitals Group, in the presence of Dr. Preetha Reddy, Vice Chairperson, Apollo Hospitals Group and Capt. Arun Sharma, Managing Director, Aviators Air Rescue Pvt. Ltd.
Apollo Hospitals pioneered air ambulance emergency services in the country way back in 2003. With subsequent launch of these services in Delhi and Bangalore in 2004 and 2007, Apollo Hospitals has seen a steady increase in number of patients using this service. Through partnerships with various aviation companies, at an average, Apollo Hospitals air transfers around 125-150 patients in a year. Unlike other helicopters these helicopters are built exclusively for transporting emergency victims. The medical crew for all transfers is from Apollo Hospitals. A set of trained and qualified emergency physicians and paramedics have been specially trained for air evacuations and these teams will be on all air-transfers. These services offer support to all types of accident and emergency patients including pediatric patients. All life-saving equipment will be available on board and even the most serious patients can be shifted using Apollo’s air ambulance services. Apart from emergency patients, organs from brain dead patients for transplant in a different location will be transported using this air ambulance network. With the introduction of this network and the existing services in Delhi, Apollo Emergency Services will be accessible to people living across south, central and north India. FYI- Apollo did not pioneer air ambulance services in India. East West Rescue were the pioneers since 1987 and Dr NPS Chawla since 1969.